I have a couple of Bibles at home that I use somewhat often. But I've always felt weird about writing in the pages or highlighting scripture. I guess it's because I don't want to deface the actual wording. I've heard of Journaling Bibles but never gave them much thought, until I received one for review. 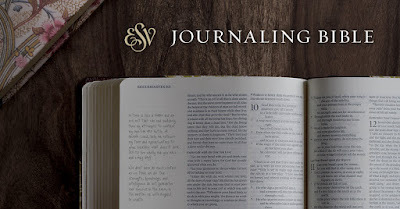 The ESV Journaling Bible has two-inch ruled margins that allow me to write on the sides of the pages, without doing anything to distort the Bible verses. And now, I can write down my thoughts, prayers, and reflections for a particular verse or for my feelings on a book in the Bible. I've just started using the ESV Journaling Bible and already see a difference in how I read the Bible. I don't have to put my thoughts into memorization or into another book. They can all be wrote down in the margins of this Bible. The ESV Journaling Bible, published by Crossway, comes in a slipcase box that is the same design as the cover of the Bible itself. The hardcover Bible has a one-year Bible reading plan and introductions for each Bible book. The front of the Bible has a blue and cream colored floral design with black edging, and a blue ribbon bookmark is included. It's a beautiful Bible that gives me the opportunity to delve deeper into my spiritual life. 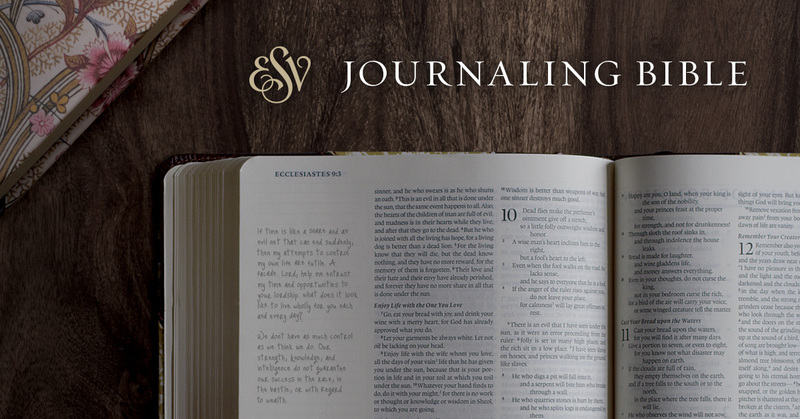 One person will win an ESV Journaling Bible. No I haven't but I would love to, I think it would help me read, learn and understand the Bible better. I've never used one before, but they look so neat! I have never really used a journaling Bible but this one makes me want to. I have never used a journaling bible, but it does sound interesting! I have not used one but would like to have this one. Yes, I have a journaling Bible that I love. I really just make notes in it. I don't do the fancy journaling stuff, but I love the extra room to write in. I have not had one that I can take notes and journal. I would like this. I have not used one before, but I want to try it. I haven't used a journaling bible yet and look forward to trying it - would be great to make notes! No, I have never used a journaling bible. Thank you for featuring this. I've never used a journaling Bible before.